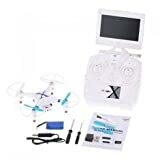 · Cheerson CX 30S drone with Monitor, Quadcopter, 2.4 GHz, FPV 5.8GHz real-time video transmission, HD720p camera, Auxiliary monitor on the controller, 4 Channels, 6-axis gyroscope, 3D pirouettes - CX30S, the most versatile video camera. · This combined with its size and 55 mm diameter propellers make the CX30S an extremely stable drone and its few 80 grams give it amazing agility. · The CX30S cheerson is a 4-channel medium drone that incorporates a 6-axis gyroscope. This coupled with its 185x185x20 mm size and 55 mm diameter propellers make the CX30S an extremely stable drone and its few 80 grams give it amazing agility. All this incorporating a complete camera and a real-time video transmission system through the 5.8GHz band for a greater range, worthy of much larger drones. The camera allows recording HD 720p video (1280 x 720) and obtaining photos of 1 mega pixel (1280 x 720). Through the transmitter control, the camera is operated by starting or stopping the video recording and the photographs are taken. The camera features a micro SD card slot where our sessions are recorded (including card and USB adapter). The CX30S is capable of performing all the movements of its older siblings, whether forward or backward, rotate right or left, go up or down, scroll right or left. In addition, it is able to perform 3D movements in any direction easily and easily (3D tumbling). All spare parts available.